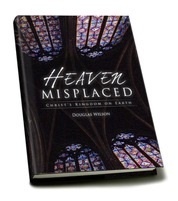 ‘Heaven Misplaced’ is an eschatological book written from a post-millennium point of view. If you’re unfamiliar with the term ‘post-millennium’, for now, you just need to know that the ‘millennium’ refers to the 1000 year rule and reign of Christ referred to in Revelation 20. The ‘post’ refers to when Christ will return. So, ‘post-millennium’: Jesus will rule and reign from heaven for the 1000 years (which may or not be a literal 1000 years) and He will return after, or post, the millennium. Another position is called pre-millenniumism, and another amillennialism. 1) Jesus is the savior of the whole world. This does not mean every last individual will be saved, but it also does not mean that only a handful of elect Christians will be saved. Jesus came to save the world and He will do just that. 2) Man lost dominion of the world in the garden to the “powers and principalities”. Jesus conquered the powers and principalities on the cross. Jesus has been given all authority. Man once again has dominion of the world through Christ. The Great Commission can now be accomplished. 3) The Great Commission will be fulfilled not when the Gospel reaches each nation, not when individual disciples are made in each nation; it will be fulfilled when each nation on earth is discipled — every nation a Christian nation — not every individual a Christian, but every nation being predominately Christian — a worldwide Christendom. This completion of the Great Commission will usher in the millennium. Jesus will not return until this has been accomplished. You don’t have to agree with the post-millennialist view to benefit from reading this book. In fact, I highly recommend you do read it especially if you disagree with this view. Often views of the end times are so much doom and gloom. This book is very positive and hopeful. It’ll get you excited about being a Christian.